The ADA Summer Doctoral School deadline for payments was yesterday, 19 November. We were, however, inundated with calls and emails from delegates who were still waiting for their invoices to be processed by their departments or employers, so we're giving everyone the opportunity to settle their account with us until Wednesday 5 December. This is also a golden opportunity for those of you that would still like to apply for the Summer School, but thought that you may have missed the deadline. 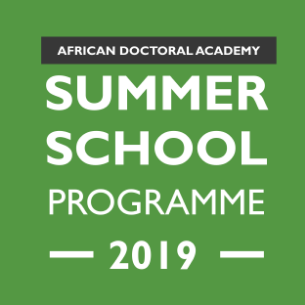 More good news is that we have been fortunate to secure additional bursary funding for current and prospective PhD candidates and Postdocs at Stellenbosch University to attend the Summer School. We are offering this opportunity with the Postgraduate Office, and you can read more about it here. The bursary is available to PhDs across all phase of the PhD. Also remember that HPCSA members can earn up to 30 CPD points from attending the week-long courses, as well as 6 Ethics CPS points for our Ethics Workshop on Saturday 12 January. As always, our programme is listed below, but please visit our website for the full programme, costs and deadlines for registration, as well as full workshop information. Week-long workshops take place from Monday - Friday each week so it is only possible to select one course per week. For those trying to find accommodation, try our suggestions on this page, and don't forget to book your complimentary airport shuttle here. The Doctoral School will take place from 7 - 18 January, with a preparatory session from 3 -5 January. The deadline for registrations is Monday 19 November 2018. The programme features a range of research design and methodology, data analysis, article writing, science dissemination, general academic preparedness and supervision for novice supervisors aimed at current and prospective PhD candidates, their supervisors and researchers in general, across all disciplines. Please note that each course below takes place from Monday to Thursday 8am - 4pm and Friday 9am to 1 pm and you can only attend one per week as they take place at the same time. 5 - The productive PhD: creating structure, gaining clarity and overcoming blocks (bookings closed: course is full). Please note that each course below takes place on the Saturday (one day only) from 09:00 – 16:00 and you can only attend one course as they take place at the same time. Please note that each course below takes place from Monday to Thursday 8am - 4pm and Friday 9am to 1 pm and you can only choose to attend one per week as they take place at the same time.